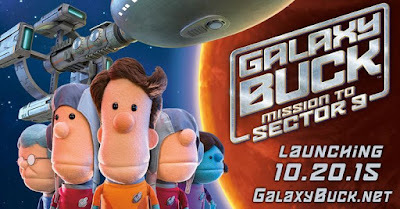 Galaxy Buck: Mission to Sector 9 is the newest video adventure from Phil Vischer, the creator of Veggie Tales. It is a fun, 40-minute video that kids and adults will enjoy, especially Star Trek fans, since the movie has many similarities to the popular TV show. The movie is about Buck Denver, a man who dreams about saving the galaxy. He works for the Galactic Mission Board, and desires to carry God's love to every corner of the Milky Way! The problem is that he doesn't have a starship, or a crew, or even a captain's license. But, he is eventually given a chance to lead a mission into deep space. While on the mission, things don't go as planned and Buck is confused. If he's doing what God wants him to do, why is everything going wrong? He is taught a powerful lesson about trusting God with everything - even our dreams! Galaxy Buck: Mission to Sector 9 will be available on DVD beginning October 20th. Fill out the entry form below for a chance to win a copy of this DVD. Contest ends Saturday, October 24, 2015 at 8:00 p.m. CST. One entry per mailing address. Might have to get this one for Dave! Sounds like we'd like it!